As America’s farmers retire, there are fewer new farmers to take their place. Lindsey Lusher Shute, Director of the National Young Farmers’ Coalition, discusses why this matters and what can be done to foster the next generation of farmers. Why do we need more young farmers? Lindsey Lusher Shute: The nation’s farmers are retiring faster than they’re being replaced, and a quarter of all farmers are expected to retire in the next twenty years. This situation has major implications for food security, the health of our rural places, and our farming traditions. What are the biggest challenges facing the next generation of farmers? Lindsey Lusher Shute: Capital and land top most young farmers’ lists, followed by health insurance and student loans. Because so many farmers discouraged their children from farming over the past thirty years, many young farmers are coming from non-farming backgrounds. With no land or equipment to inherit, these farmers are starting from scratch and face big obstacles to getting a business off the ground. With land prices skyrocketing across the country, finding an affordable and stable place to settle can be a tremendous challenge. In terms of capital, there are more lenders willing to take the risk with new farmers, but still not enough. Even when farmers can get a loan, many are very concerned about how they’ll make it through the first years when they’re figuring out their farm systems and developing a market. How can schools, parents, and communities inspire young people to care about where their food comes from? Lindsey Lusher Shute: That’s a great question. I know that I’ve always cared about farms and food because of the amazing green beans, cantaloupe, and tomatoes that I ate at my grandpa’s farm as a child. These fruits and veggies tasted better than anything I’d ever eaten at home, and made me crave that kind of produce and eating experience for the rest of my life. I know that taste had a lot to do with this, but it was also seeing the plants and my grandpa carefully tend them. So, to answer your question, young people really need to be exposed to delicious and fresh food, as well as to actual farms where the food is being produced. Community Supported Agriculture (CSA) is an excellent opportunity for families to bring their children to a farm, and to get a wonderful selection of food at a reasonable price. School or community gardens are also very powerful ways to connect kids with their food. Why should young people want to become farmers? Lindsey Lusher Shute: It is the best career around! Farming can be physically tough, but it guarantees independence, time outdoors, and a real intellectual challenge. There is also an amazing community of new farmers in the US, who support each other and make farm life pretty fun. 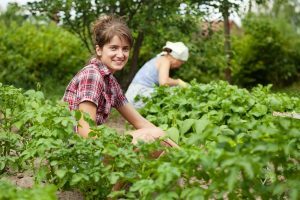 How can we support young people to become farmers? Lindsey Lusher Shute: Young farmers need support from government and citizens to succeed. From Congress, these farmers need a Farm Bill passed and adequate support for training and other programs that help new growers succeed. Citizens can help by purchasing food from young farmers, and especially shares from Community Supported Agriculture farms. This business model is extremely valuable for new farmers as it provides much needed capital for seeds and supplies. 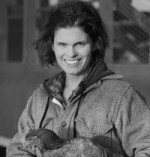 Lindsey Lusher Shute: I support independent, family farms because I want to eat delicious food, nourish me and my family, feel good, and keep my rural community strong. Lindsey Lusher Shute is the Executive Director and co-founder of the National Young Farmers’ Coalition (NYFC), a membership-based organization dedicated to the success of the next generation of sustainable farmers in the United States. NYFC’s supporter network includes thousands of farmers and consumers from all fifty states, who work together to advocate for change in Federal policy, develop new farm technology through the Farm Hack project, and solve local issues through regional NYFC chapters. Lindsey and her husband run Hearty Roots Community Farm, a 600-member CSA farm, in the Hudson River Valley.